The June Alley Inn, located in the western mouse city of Barkstone, is lively as a throng of mice excitedly spin fantastic yarns in a storytelling contest! One such tall tale is about a pauper mouse who risks life and limb to find the best gift for the most-eligible young lady mouse in town. 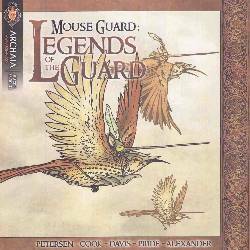 Legends of the Guard is a continuing anthology series with tales by Guy Davis (B.P.R.D.) and Katie Cook (Fraggle Rock).